I got my knitting mojo back, the tried and true, no fail way. I cast on. Socks, naturaly, lovely toe up sock. Not socks from my list (what? Follow a plan?) 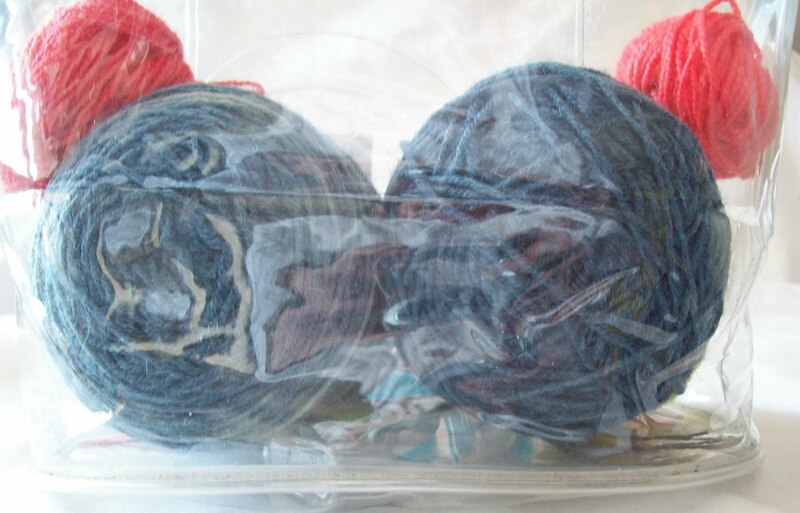 but these—this is Deborah Norville's Serenity sock yarn—a post Stitch 'n Pitch purchase--(there was a sale and coupon) Just the two balls (50gm) in a color called Picasso Marble - Of course they really don't match much in my wardrobe—well not a good match. Medtium and dark grey, some green ( really lovely green like green marble) and some redish orange. 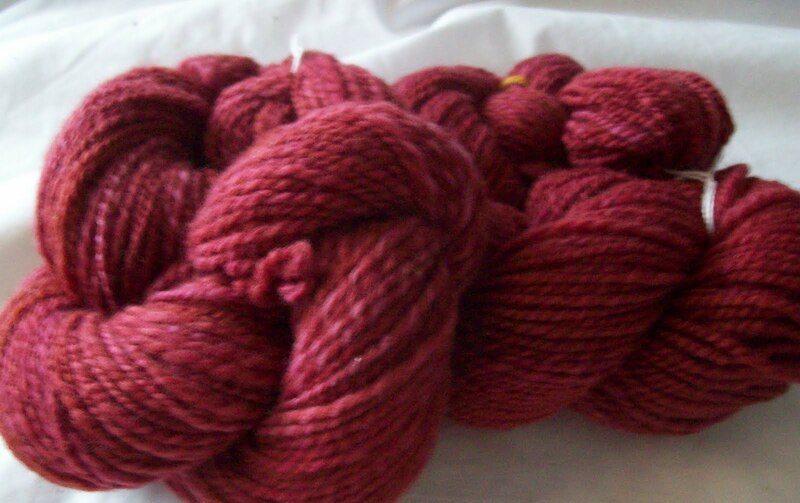 This yarn is one of last years 'sock club kits' I made up and never got around to knitting. Its so handy to grab and go. The yarn is one of those super fine socks yarns –I am knitting with 1's--(2.5m) but I could easily go down to size 0, (2mm) and have a denser fabric that still wasn't too stiff. 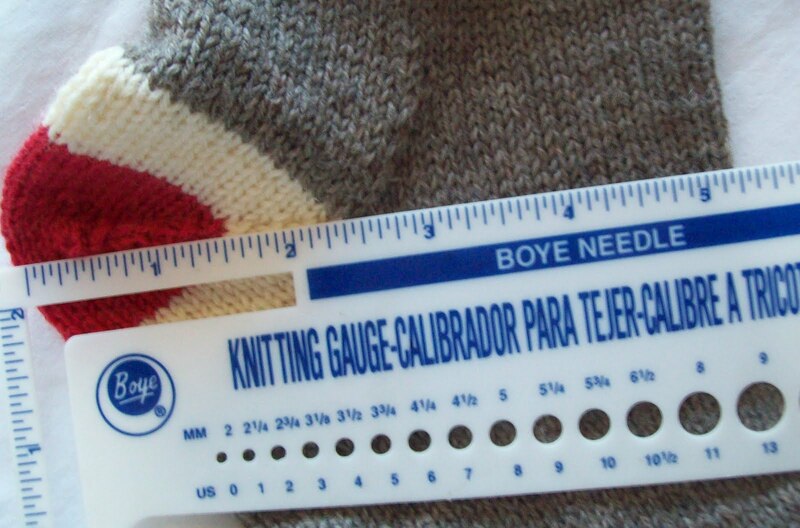 A 9 stitches per inch gauge is about as small as I go for my gunboat sized feet. Toe up this time—for no other reason that its been a while since I did a pair of toe up socks. I started with Judy's magic cast on –because I like it best for socks. 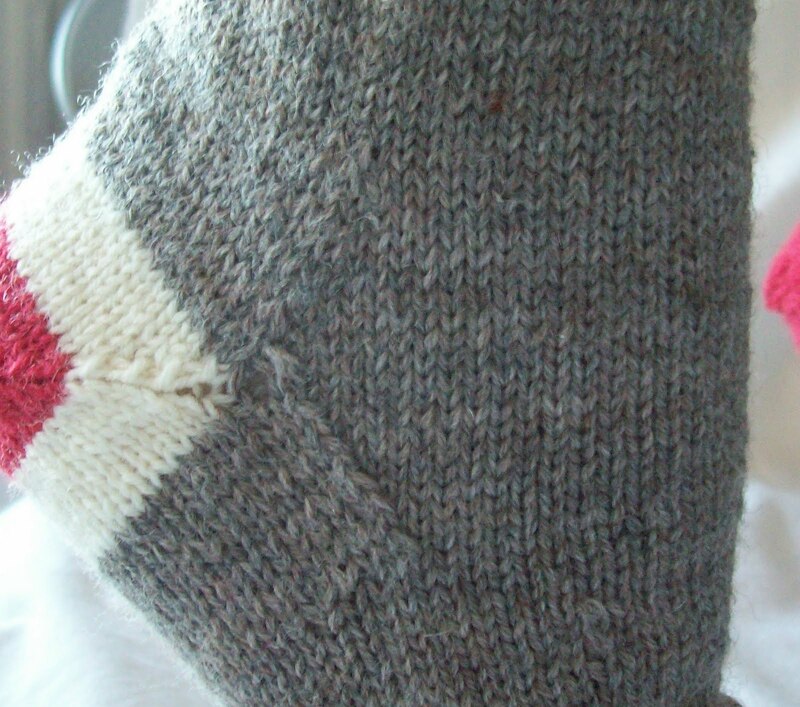 I cast on 22, and by round 2 had 24, (one increase in the side edge of the round, to help prevent mouse ears that sometimes occur with this cast on for toe up socks. 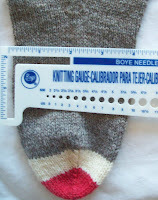 Now I am a up to 68 stitches—A little more than I need, and the toe completed. You can't see it—but the fronts (started already—but just 1 R) will have side cables—A purl, 4 knits, a Purl—not a huge cable element-(I grew up wearing cabled knee socks as part of a school uniform—and I learned to dislike both knee socks and cabled socks!) but just a small cable stripe. The yarn patterns enough that I don't need or want too much in the way of design—but just little somethng to keep it interesing. So now, with mojo restored, I'll go and finish my mystery project (on great honking big size 8's) and finish all the details. I still need some buttons (but the closure is actually going to be snaps) so I can chose any button I want, and not worry too much about the size. I need a feather boa too, to finish the top neck edge.. Details, Details, its all about the details. And I'll run to the store for bread and milk and eggs (not) since once again this week, snow. 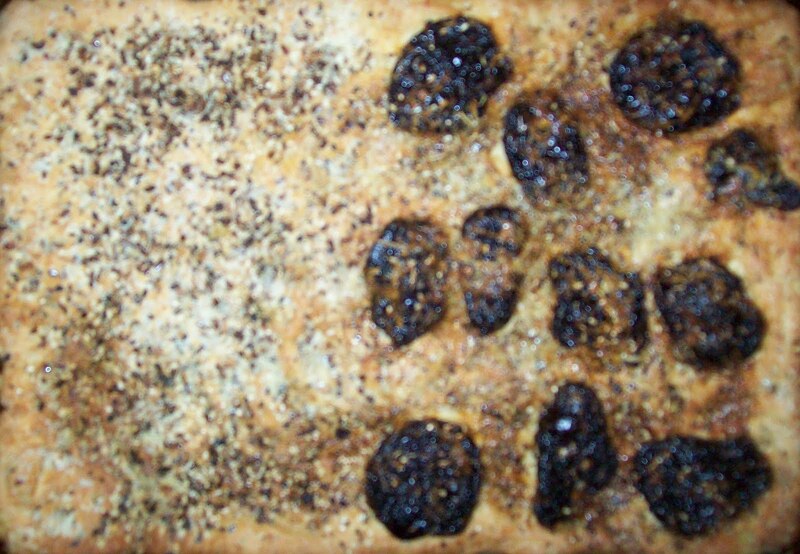 I do need some supplies (fresh veggies—especially onions) but not the classic. I think even the kids are growing bored with all the snow. Its just no fun anymore. Worst of it is—Traditionally February is the month with the heaviest snow fall round here. And we are starting the month with fresh snow. Already (like much of the north east (and even the south east!) we have more snow--twice the norm--for a year. I think for NYC the count is at 56 or so inches so far--and the average for a year is close to 24 to 25 inches. NYC is ten square miles--The measurement reflect Central Park snow fall (at the weather station.) I am closer to LGA (3 miles) than to Centeral Park( 7 miles) and based on the snow fall measurements at LGA I think my neighborhood has had closer to 60 inches of snow. It's just too much! It's going live--but its not yet done. 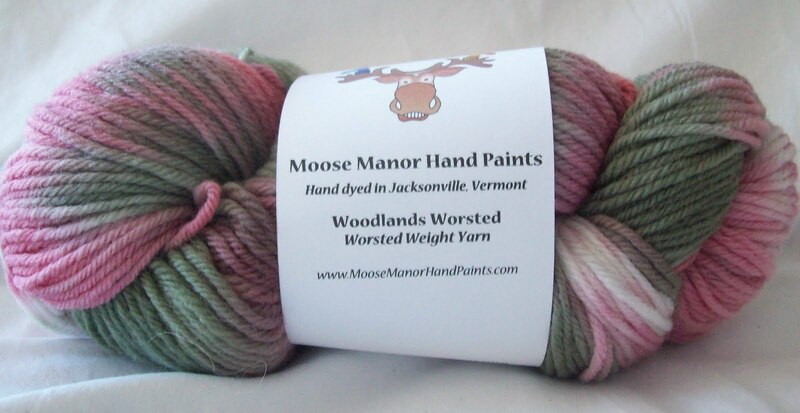 More links to come (to other blogs I love, and other stuff (Ravelry natch!) some information about me, my schedule (pretty open right now, but that will change!) and (not yet even under construction!) information about arranging for for classes. (at your guild, in your LYS, in your neighborhood). I'll still be making videos, and writting tutorials, and making blog posts--but if you want to find something, it will be easier (some what easier now, a lot easier as time goes by!) to head over to the web page and find it (either directly or as a link) there. One page that doesn't work (yet) is the contact me page--so for now, all comments have to be here! 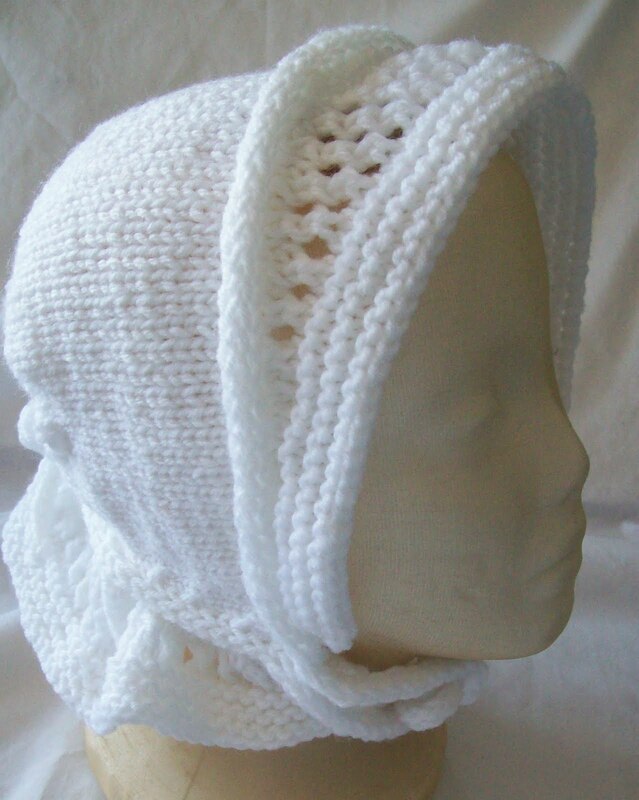 This is the first proto type of a new hat design—The Milk Maid's Bonnet. It has a lace brim in front, and a tied ruffled peplum back. 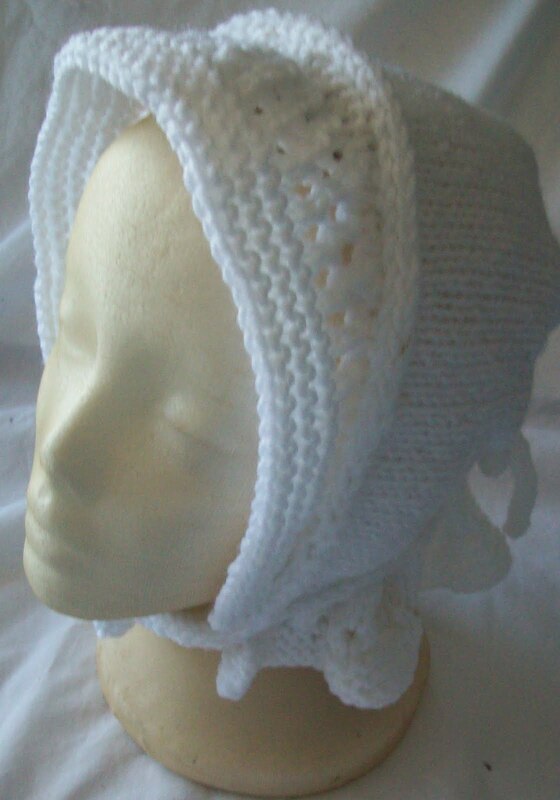 It has lots of shaping—short rows in the main body of the hat, along with pleat like decreases in the back, the peplum and brim have short row shaping too. But I think it's worth it--all the detail make the hat something special. The whole thing is a distraction from what I should be knitting. Before I refine the details of this hat, I'll get back to what I should be doing-- and finish the mystery project! But it is a pleasant distractions, isn't it? The bad news is the second pair of skeins are hanging on like grim death—and still not completely knit up. The good news (and good new it is!) is: the mystery project measures 11 inches—which is more than half way done! I've finished element 2 and now I am moving onto element 3 –well half true. Design element 2 (and 3 ) are staggered, and repeated (once) and I've just finished the first repeat—but it is progress and it always get more interesting to knit when things change. Today the first repeat of design element 3, (and some of 2, as well, but half as much) and soon, very soon, balls 5 & 6 of the yarn.. When that happens, it will really feel like progress is being made!Meanwhile, I've bagged up 6 socks kits. 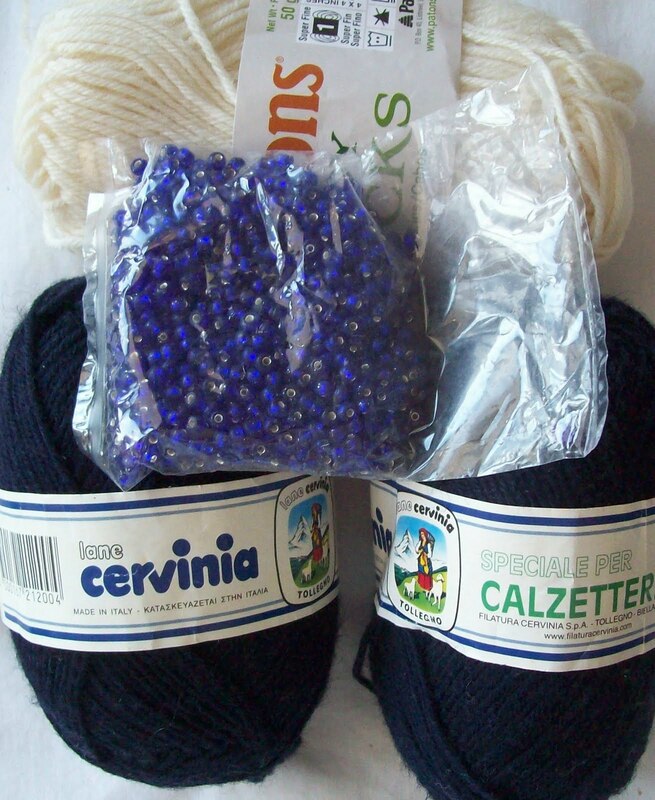 Next, the blue and white swirl top socks--(almost the same as the grey & raspberry ones from late last year)--but the swirl pattern will be accented with beading. 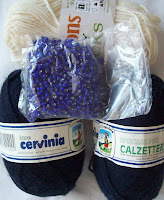 The blue is a dark navy--the white and beads will really dress it up. My indigo yarn (dyed for me by LICraftGirl(dyed by her for me in '09) is being paired with the last few yards of the bright peachy koigu—Lots of contrast- I suspect the indigo will bleed and fade, and the bright peach will be muddied.. Or maybe it won't—it will be fun to see how these socks weather time and machine washing. 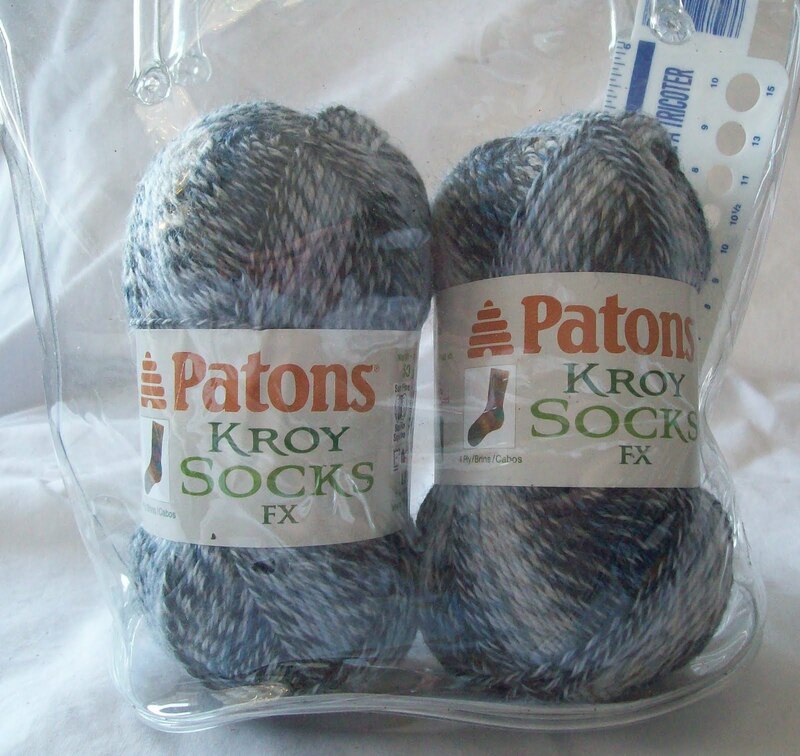 The KroyFX in gray will be worked in a pattern with a granite stitch –bedrock socks! NYC's bedrock is 2 different kinds of granite—The Bronx is gneiss, Manhattan is schist, (and Queens is (for geographic purposes, part of Long Isand—which is made from 2 eroding terminal morains.) I almost wish for some angelica or other sparkles—most of the granite in the area is shot through with mica and is glittery, and this sock yarn is matte. 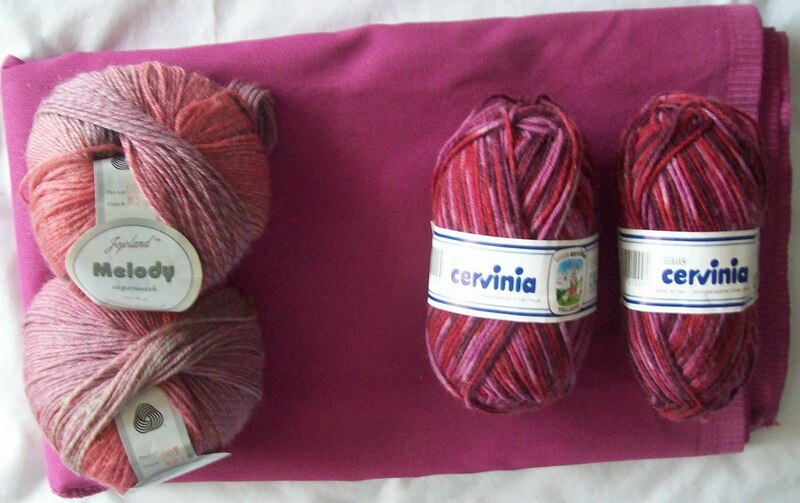 The Cervinia (the red) are not on my list(see The PLAN) —but I like red socks, and I have plans for a red skirt... and they made the cut. 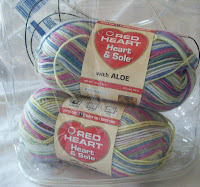 I haven't got any more plans for this yarn except to make socks. 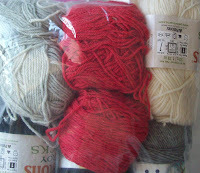 The last one is some yarn left over from LAST years sock club kit. 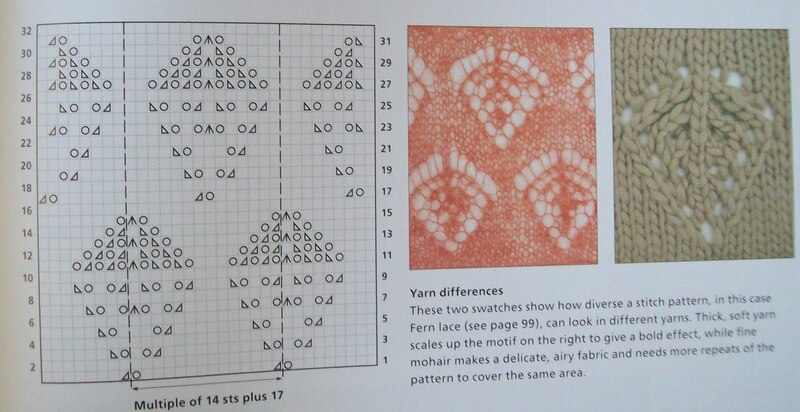 I still don't know what pattern or theme for this yarn—one reason they never got knit last year! 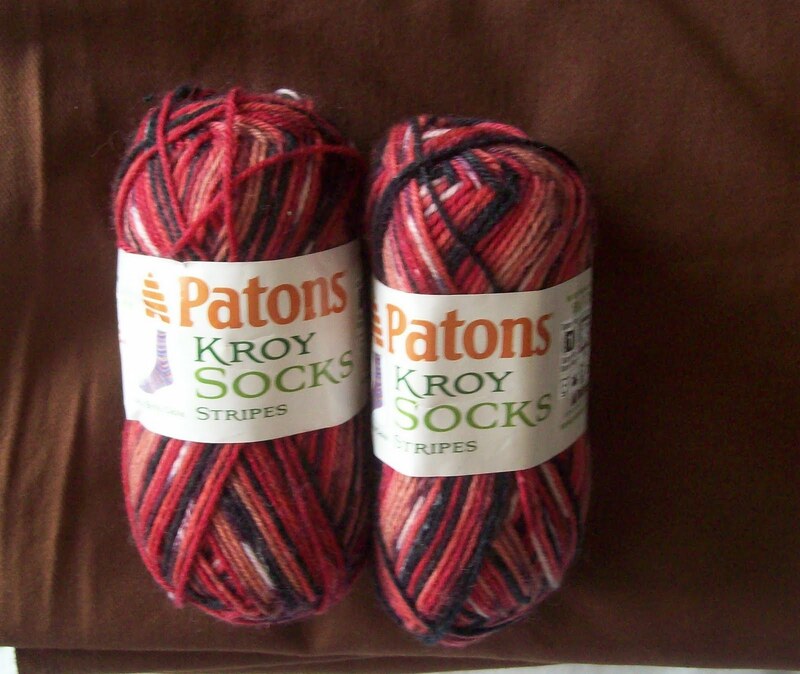 Likely a generic sock –I'll just let the stripe pattern of the yarn provide all the interest. The bright colors are spring-like knowing me-- I'll get them finished by September! But that's OK—I like to keep socks—unworn—for a while. I like to let them mellow out—and I like knowing any day can be special –I can wear a pair of socks for the first time. (the Roy G Biv socks, finished in June last year , didn't get there first wearing till October) I haven't worn the Koigu socks yet, and the monkey socks are waiting in stand-by, too. The whole kit and kabododdle--ready to be put on a shelf, and plucked off any time I am ready. one, (the Peachy Lace socks) were extra tall socks (10 inches finished length—vs my more usual 9 inch tall socks) Over the course of time, it balances out to have some short, some medium and some tall socks. I don't particularly like knee socks, so they are not ever going to be in the mix! Some details--Remember how I measured my leg, foot and ankle? At all times, the sock is smaller than my actual measurements--this is called negative ease. I cast on 64 stitches, at the gusset I had 74 stitches, in the foot 60 stitches. (I made 1 extra set of decreases in the gusset and a matching set of decreases, at the “side seam” on the bottom of the foot)The little gusset is quite evident--if you know were to look for it--but its also small and not very evident if you don't! This slight changes in stitch count makes a sock that is barely snug on the leg, has plenty of ease at the ankle, and is a bit snugger on the foot--just the way I like my socks! 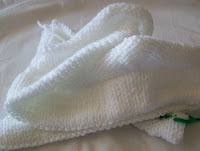 Without the 10 extra stitches-An extra inch of sock!--the ankle would measure about 10 inches—and would be the snuggest part of the sock—instead of being the loosest! Still, everywhere, the sock is smaller than my actual foot. It fits because knitting stretches. 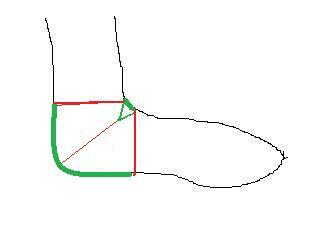 If the sock were looser, (closer to my actual foot measurements), the sock would tend to slip and bunch up—we've all had that happen at least once--A sock that works it way off our foot as we walk, and bunches up (uncomfortable!) in ours shoes! The extra stitches in the cast on and leg work for me. I like a looser sock (well looser in the leg!) and the extra stitches work well with the heel. When I undid the waste yarn, 1 picked up all the live stitches (32/31) AND I picked up a stitch in each 'half stitch either side of the waste yarn.--for a total of 34/33. Then I made a single increase, (on the foot) to correct the count—34/34. So the heel was worked with even more stitches—these extra stitches are the source of the extra ease--they also made it easier to make a deep heel—another factor in a good fitting sock. Many knitters dislike this style of heel because it is too shallow –extra stitches allow an extra deep heel with out ending up with a too narrow and pointy one. On busy days, when I have been out and about and doing thing, my snug when I put them on shoes are almost a half size too loose—unlike many who find gravity (and water) have made their feet swell! As I settle down in the evening, things change again—less movement, more stiffness and swelling--and in the morning after a good nights sleep, I start over again. 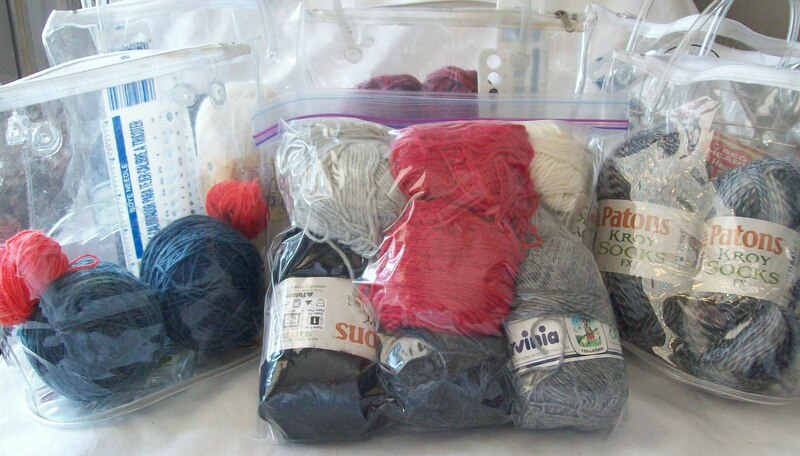 Speaking of starting over again—I think I will pack up some of my sock club kits today—I won't start on my next sock till I have my mystery project complete (and I am behind on my self imposed schedule—so I need to get cracking on that!) But it will be nice to have a pretty display of potential socks all lined up—ready to reach there potential lickity split! What can I say about socks that hasn't already been said?! 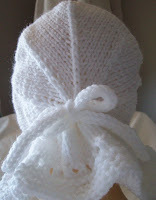 Sock are closed end tubes, (so is a hat) that, most frequently, have a bend, for a better fit. Toe up (an eastern style) or Top down (a european style) (in the US—both styles are common!) In addition, sock can also be knit crosswise, flat and seamed, and other novelty styles. There are a number of cast ons, and edging, then, frequently there is a cuff. 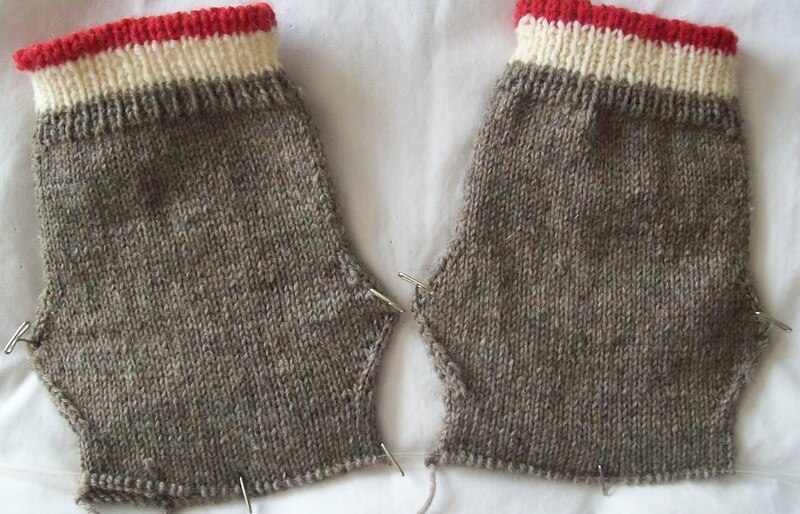 Frequently the cuff is ribbing (and I couldn't begin to count all the styles of ribbing!) 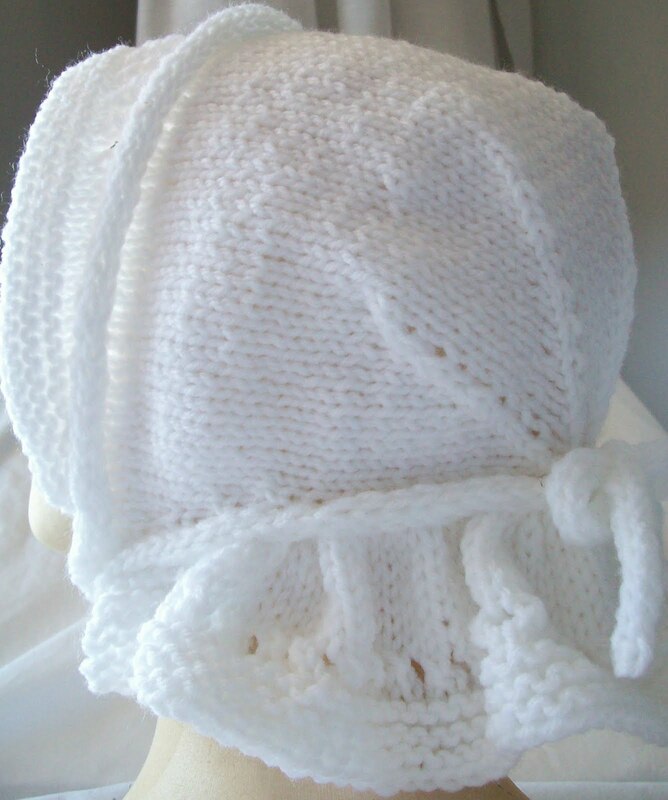 but garter stitch, and edgings (I-cord, or lace, or double knit tubes.) are almost as common! Combinations of details, (lace and ribbing, or icord edging and ribbing, other combinations are as varied as can be. 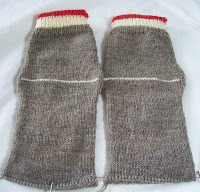 It not uncommon for a sock to have several cuff details! In sports socks this can be non-existent! On the other extreme are full length hose that end somewhere in the mid thigh. Knee (sock that end just below the knee) to 'medium' or mid calf socks are, I think the most common. The leg portion of the sock is—frequently-- about 7 to 9 inches (but 3 inch 'short socks” and lengths between 3 and 9 are commonly found. The stitch pattern used in the leg of the sock can be a simple stocking knit, or any one of thousands patterns—from simple to lace, to multi stranded color work. 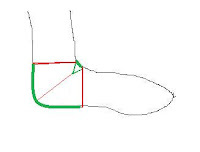 At the bottom of the leg, is the heel –a shaped portion of the sock-- and heel again are an area where there are many choices, many variations. There are several other styles—but most are less common. Some are 'combination' heels—short row heels with gussets. In the F/T/G heels, there are to my limited knowledge—(I knit a lot of socks but I am not an expert in sock styles/details) at least 6 ways to make the turning, and as many ways to place gusset. The flat knit 'flap'? It generally stays the same—but there are dozens of common stitches patterns used in the flap—but really almost any stitch pattern can be used. Even with limited choices, 10 (say) common stitches for the flap, and 6 ways of turning the heel, and 6 more ways to place the gussets, this one style of heel (a F/T/G) has 360 options! And this is just one style of turning a heel! 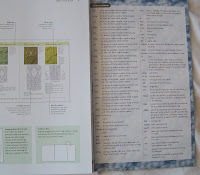 I like to think of the options as 1 from column A, (flap) 1 from column B (turning) 1 from column C (gusset)! I have knit a few socks (in my lifetime, about 250--(a beginner to sock knitting by some reckoning!)) and I've never 'repeated' a combo yet. (and I still have lots of options available to me!) --Of course, 1 reason for no repeats yet, is a good 40% of my socks aren't F/T/G style—but some other style of heel. It's easy to see why some knitters fall into habits of making the same style heel MOST of the time—there are so many choices, it often easier to pick a single style and stick with it. 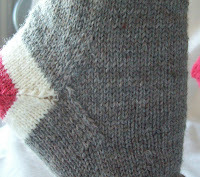 The foot of the sock, is frequently patterned as the leg was (or wasn't!) 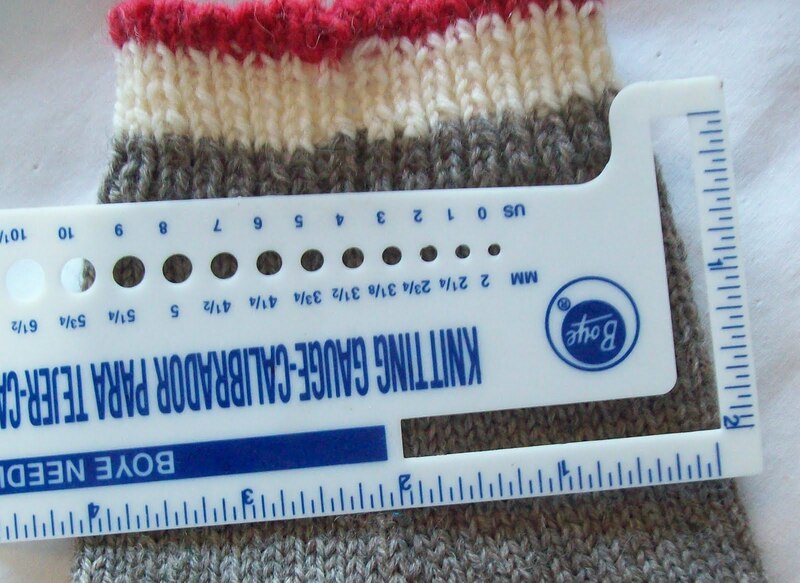 on the instep, and has a plain (stocking knit) on the sole. With stranded color work socks, there is frequently a different pattern on the instep than there is on the sole. Finally, the toe. And once again there are a number of options.. Pointed (eastern style toes) or truncated trapezoid toes (most commonly called a flat, or French toe), round toes, star and cross toes. 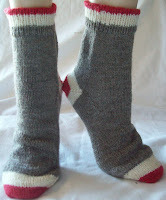 Some socks (Highland cabled socks, for example) are knit with worsted (or even aran weight) at the cast on and leg, and heavily cabled, but at the heel, there is a change.. no more cables, (which creates ease) and the heel and foot part of the sock knit with finer yarn (something like a sports weight) and smaller needles. 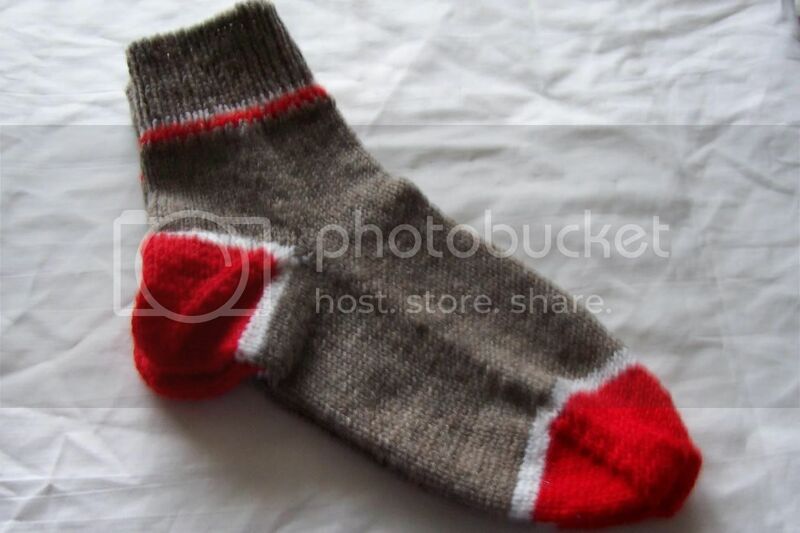 Every element of sock—yarn, gauge, direction of knitting, cast on, cuff, leg (pattern), heel, foot, and toe and finishing offers dozens of choices. And yet, in the end, socks are simple. They are closed end tubes, with a little bit of shaping at the heel. Doesn't really count for much. It's more like a wish list.. a starting place. It might work out... or the plan can change! Last summer I got a few new skirts made—and the plan is to get a few more made. I have the fabric, I just need to get the will! And there is another plan (Homestyle sock club socks) and another plan (socks to match cloths) and the big plan is to make some clothes (skirts mostly) and to make some socks, and to have them more or less go together! The fabrics that are on the top of the pile (for this moment) are these 4—a piece of red, heavy weight broadcloth, a piece of plum(red/violet) even weave,a piece of brown twill and a piece of brick red even weave. The Y-B normal socks will go well with the brick red, too. The list of sock that will match the real red? Almost endless! 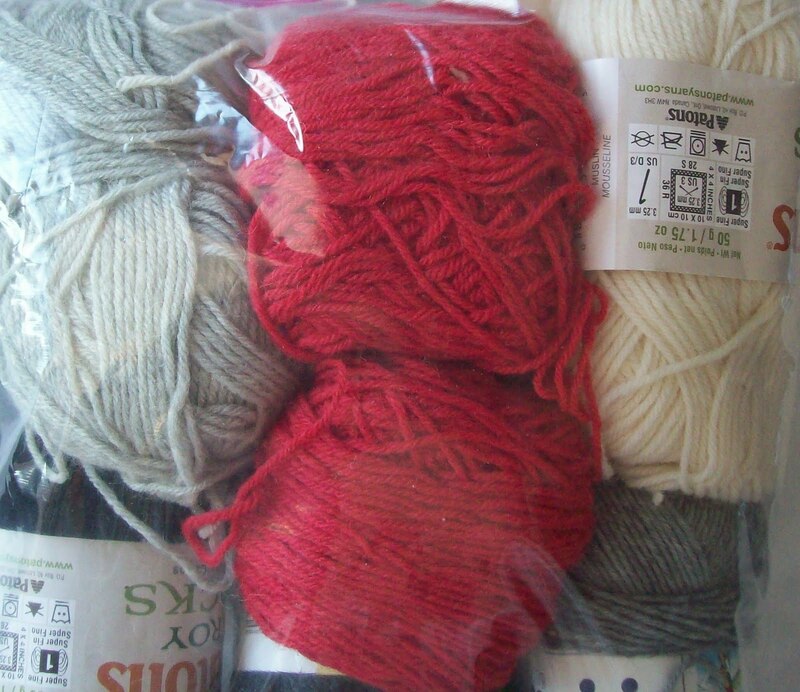 But I have a bunch of yarns that will also work—As you see--I have paired them up. 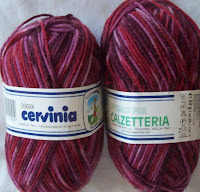 These yarns have moved to the top of the pile too. About half of the socks on the list are “free -be “ socks—knit from mostly left over skeins. 3—Crazy eights! Black base, with 8 scraps of yarn worked in--in vertical --cables? or..? 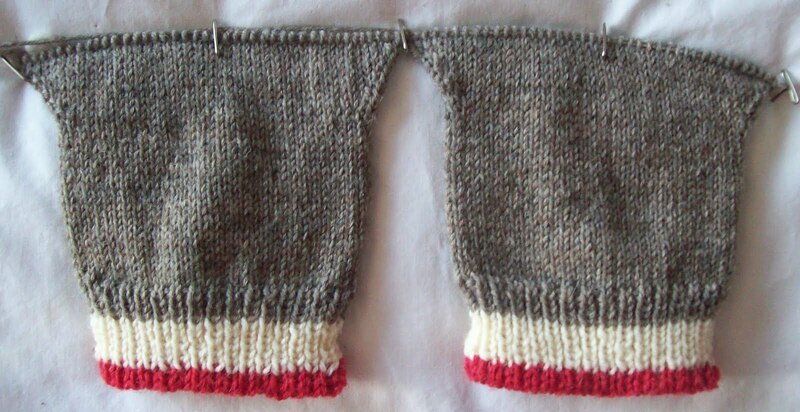 12—Striped oblique rib socks (colors undecided!) 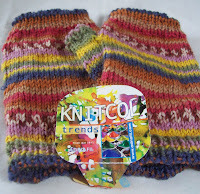 I knit a pair like this for a swap—and ever since I have wanted a pair for myself! 13—Another pair of Swirl top socks (Raspberry/Grey swirl)socks—Only in Navy with a white swirl and navy beads. 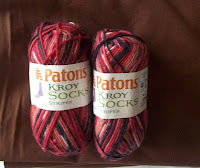 And a pair of Monkey (brown/red/white socks) –which are already on needles! 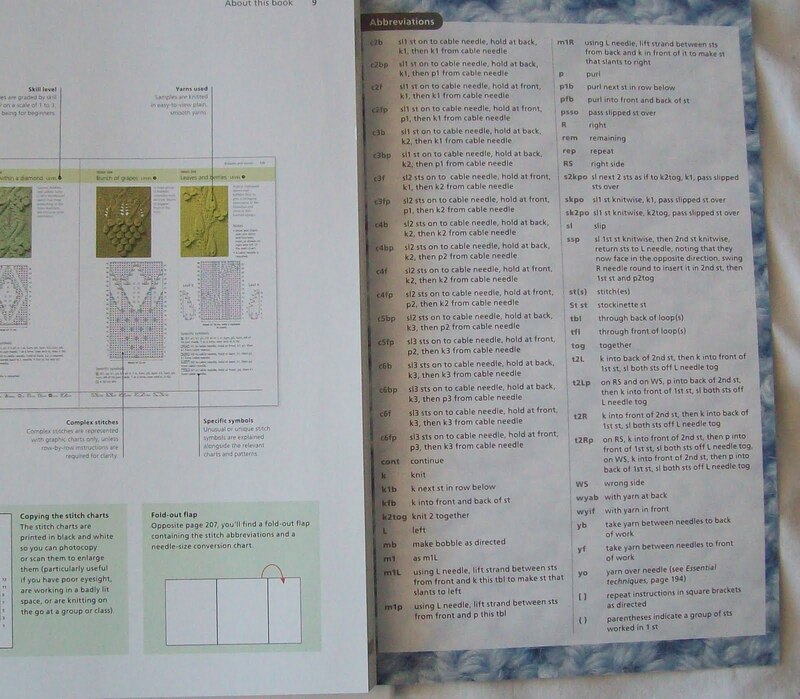 --That is just LIST 1 for sock ideas—I knit fast, but I generate ideas for knitting socks faster than I can knit them. And 13 pairs is an ambitious list—even if I did knit more than that last year (but a lot less the year before that) Where I am ever going to get time to add in socks from those match yarns?